I spent a lot of time agonizing over the beginning of Forbidden Rose. I rewrote the beginning a dozen times. Here's a beginning I wrote and discarded and put in and took out and put in and took out. It was almost Chapter One. Instead, it went in the waste basket. Such is the life of a writing snippet. France was a black line cut between the starred sky and the sea. They were killing each other in Paris and at convenient spots in the countryside, all in the name of Revolution. Doing it in imaginative ways. The gates of hell were open and all the devils were loose. If there'd been a general increase in liberty, equality, and fraternity, he hadn't seen it. William Doyle took a wood cask from a smuggler, rested it on the gunnels to shift his grip, and lowered it over the side, down to outstretched hands. The next cask was ready when he turned back. Everyone worked in practiced, heavy-breathing silence, in the dark. The rhythm to it came half came from these Devon smugglers, who knew about heaving bales and boxes from one boat to another, half was the sea itself. The sea lifted the French fishing boat towards him and drew it back, then lifted again. He and a barely-seen Frenchman timed the waves and passed cargo when the ships knocked sides, clapping against the bags of sand that kept the hulls silent. This cargo was Assam tea leaves, pressed into hard blocks and packed tight in waterproof kegs. It'd be poured into teacups in the Faubourg St. Germaine by the end of the week. He didn't expect to get to Paris half that quick himself. If he ever got to Paris. That was looking damned problematic. His own personal cargo was the two crates over there, bobbing in the French boat. Counterfeit notes. Troublesome stuff. Then there was the boy, also troublesome. He was starboard, puking his guts over the side as he'd been doing with some regularity, every ten minutes, since they left Dover. Almost made him feel sorry for the murderous little animal. Almost, not quite. This was just a duckfooted mess of a job. Doyle hefted the last keg, grunted, and handed it down. Soft-footed on the deck, whispering, the French smugglers scuttled about, tying and securing and covering illegal cargo with canvas and fish. The transfer was complete. Time to get a move on. The boy crouched with his back to the forecastle, pale gray in the flicker of the dark lantern, sullen as a dirty rag. He strolled over and nudged all that suffering with his boot. "You." He spoke French. The boy understood just fine. "Get the bags." "Or stay on the boat. They'll drop you off somewhere. Mid-Channel, probably." The boy, Hawker, got to his feet and staggered off to get their luggage. I kinda regretted not using this. Now, just in the interests of full disclosure and maybe somebody is interested in how this all works, down below the cut I've put up what this little segment actually looked like when I set it aside. Which is to say, with all the notes I make for myself still in. This, below, is what a Second Draft looks like. France was a [thin black] line [cut] between the starred sky and the sea. They were killing each other in Paris and at convenient spots in the countryside, all in the name of Revolution. Doing it in imaginative ways. The gates of hell [caps?] were open and all the devils were loose. If there'd been a general increase in liberty, equality, and fraternity, [caps here?] he hadn't seen it. If he ever got to Paris. That was looking damned problematic. His own personal cargo was the two crates over there, bobbing in the French boat. This was just a duckfooted mess [Irish jig] of a job. Doyle hefted the last keg, grunted, and handed it down. Soft-footed on the deck, whispering, the French smugglers scuttled about, tying and securing and covering illegal cargo with canvas and fish. The transfer was complete. Time for them to get a move on. [american? not period? date?] The boy crouched with his back to the forecastle, [something on deck. what the hell is a forecastle?] pale gray in the flicker of the dark lantern, sullen as a dirty rag. He strolled over and nudged all that suffering with his boot. "You." He spoke French. The boy understood just fine. "Get the bags." Still, I'm glad you opened the book the way you did. Much more intense / unique / revealing of character. Weeeell . . . If I'd USED it I would have looked all that sutff up. Lovely tidbit. I can never have too much Doyle in my day. However, I think you made the right call, opening with Maggie and the rabbit. It's never easy to know what's going to work exactly right, but you've done wonderfully well. I kinda like showing that Adrian gets seasick easy. But, in the end, I had to start with the heroine. Hated to let this go. There is just so much you 'see' that you can't use. I hate that. Thanks so much for sharing this with us. I love seeing this little extra piece of Doyle and Adrian. Feel free to dig through the waste basket and share more outtakes whenever the mood strikes! BTW...I love how Maggie and the rabbit open FR! I really think you made the right choice to start FR the way you did. Count me among those who think you made the right decision in opening with Maggie and then showing us both Doyle and Adrian interacting and Doyle through Maggie's eyes. I also like that what we know about Adrian (murderous) is revealed more gradually. Like Elisa, I loved "what the hell is a forecastle." Reading your blog and your books, I have the feeling you know everything there is about the period, and it's damned intimidating. Glad to know you still have to look things up occasionally! P.S. I don't know how or why Google started to refer to me as Annie P, but I'm the plain ol' Annie who posts here with irritating regularity. I'm sure I pushed some button by mistake, but damned if I know how! I not i... typing too fast here. I get distracted with all the possibilities. Technical term is 'predator confusion'. Forbidden Rose was the hardest story to 'start' because there were so many ways to do it. If I heard the outline from somebody else and I were handing out advice -- which I am feeling less and less qualified to do, btw -- I'd tell that somebody to start with the scene of the chateau burning. Big exciting scene. Arguably the inciting incident. Flames, screams, escape, struggle, straightforward heroism, burning-of-Atlanta stuff. Put it in realtime, I would say. Put it on stage, I would say. Don't waste it in a flashback. Well . . . I didn't put that 'Hey, Yo! The chateau burns' action up front because the story is not really about Maggie facing the loss of wealth and power. It's not about being heroic on a grand scale. It's about how Maggie has been quietly risking her neck to save people. About her doing it even though she finds it thankless and scary. Doing it because she can't NOT do it. So, anyhow, the beginning scene was hard to decide on and caused much fairly boring indecisiveness on my part. It's a good thing the possibilities narrow down the further you get into a story, because otherwise I'd still be sitting here with the manuscript in my lap just paralyzed by indecision. I know there are settings. There are defaults. There are mysteries. And we all have many names. It is like falling into a Russian novel. I do not know everything about my era at all. Am the veriest amateur. But most of all, I avoid messing about with boats. 'Things maritime' is a quagmire inhabited by persnickety experts. I tippytoe around its uneasy edges and do not send my people to sea because I am not daft. And I still have not decided just the size, shape and extent of the torch he carries about all these years. I wish I had a better understanding of what it is folks particularly like about Adrian -- somewhat a mystery to me -- so I could make a lifelong relationship work into that. I guess I'll just have to go with the way I see him and hope folks like it. Whatever it is you've been doing to see him so far seems to have worked! I like him because he's... young but wise beyond his years - but not callous with it, like a petty bully. I like the way he sits back and absorbs events - like Doyle falling for Maggie - without overt comments and questions. And of course I admire his swiftness, his ability to wriggle out of so many dangerous situations, his memory of maps and languages, all that. Oh I could go on and on about Adrian. He's the wounded hero/damaged bad boy you know is wrong for you but you want him anyway (and you just know you're the woman who is finally going to sooth his damaged heart); the brilliant, cool boy in school you can't have; the dandy with nerves of steel--and it's not even nerves, he relishes the danger; the loyal but sardonic colleague/accomplice (friend doesn't seem quite the right word); a lover of language and knowledge. And with all that, he genuinely loves women. And I adore the voice you've given him. That scene when Gray or Doyle (I forget which one) tells him they're going to manage the surgery on their own and he replies "how intrepid of us"? I was all in from that point on. That's not to say I don't love Doyle (I really love Doyle), Gray, and Sebastian, and God knows any one of them would be a more sensible choice, but Adrian's Spike, the pre-pumped Robert Downey, Jr., and Captain Jack Harkness rolled into one and wearing a cravat and waistcoat. How is a woman to resist? Don't know if you're a fan of the great Patrick O'Brien (of the Aubrey / Maturin, Master and Commander series of Napoleonic-era seafaring adventures), but O'Brien is widely known as a past-master of the minutae of that history. Awesome level of detail in his books. People write glossaries of maritime words to help laymen through the novels, and there are several "companions" for sale full of detailed sketches of ships and all their working parts. Well, I read somewhere once that a fan of O'Brien invited him (late in his life) to sail along for an afternoon on a well-preserved old ship, and expected O'Brien to reveal all sorts of amazing expertise, and more or less take the helm. The writer of the article said that, to his surprise, O'Brien seemed to know *absolutely nothing* about the workings of the ship. They didn't discuss it explicitly, so maybe O'Brien was just being very modest or just sitting back and enjoying the ride, but the article-writer was left with the impression that O'Brien really had no clue about the actual physical reality of how anything shipboard worked. He ended up concluding that O'Brien was just so good at borrowing from the historical record and doing on-the-spot fact-checking that it *seemed* he knew everything, at least on paper. The big picture apparently didn't add up to anything coherent in O'Brien's head, but he never made an error--or at least nobody ever caught him out. I love the Doyle boat scene too, and I'm really glad you shared it, but I don't think it woudl have been the right start. The flashback I would have loved is how Doyle got Adrian--did he really win him or was it more that he lost and got him as the loser's prize? If he won him, why did he want him? I love how Dunnett-esque this, and am glad you shared it, but I think you made the right decision opening with Maggie's hunger and the rabbit. 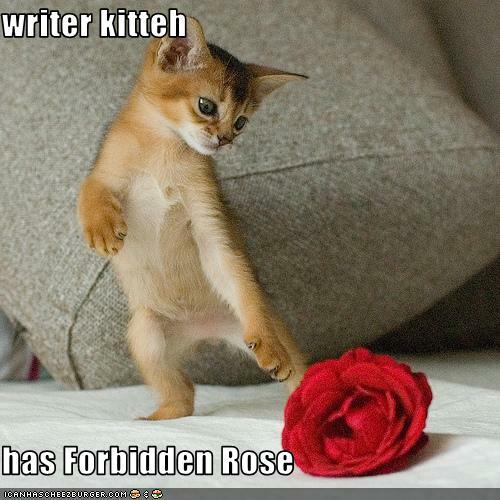 Forbidden Rose is her story. I'm having a bit of trouble getting hold of Justine's voice. Being 'inside her'. She has to be somebody Adrian wants, above all others. Tough. This is just tough. You have put your finger on it, I think. I open with Maggie because it's Maggie's story. And really, a couple pages of introspection isn't going to bring civilization as we know it to an end. Folks have done worse in the history of literature. I do keep seeing Adrian as Spike. Yes. Setting aside all the slash fiction *g* I have to ask myself what works in the long term for somebody like Spike. What does he need? How do I write his lady? I'm a great fan of O'Brian. I've read everything he's written. I wouldn't want to approach anything having to do with ships upon the sea myself, though. I'm not drawn to it and I'd feel worried about getting stuff wrong, no matter how much original material might read. I feel the same way about armies in battle. I have to grin at the anecdote of writing authoritatively about ships and not actually knowing anything practical. That's me and just about everything I write. Many words. No real knowledge. I try to run stuff past people who DO know so I don't make huge bloopers. You're right. The rabbit scene reveals Maggie's character in a way running or fighting off attackers and being heroic wouldn't. I would love to tell the story of how Hawker got pulled into the British Service. I know what happened, of course, but I haven't found the place to fit this in. It's not going to come out in the JUSTINE story, unfortunately. Also glad you opened with the rabbit scene. It worked on many levels and set things up. though I also love this out-take because I also enjoyed seeing Doyle and Adrian interact, how Doyle was a good mentor to him, and Adrian picking up on Doyle's traits without noticing it. though they are very different personalities. So more out-takes please, when you have time! Fortunately, I do not have so many outtakes sitting about, littering the landscape. I will keep an eye out for them, though. I know there was a good bit the editor made me cut in the first quarter of the book. Wholly justified on her part. Yes. Maybe some of that would be interesting . . . I do like the Adrian/Doyle interaction, and it has to be redefined every time I open up a new manuscript. Did you notice that in 1811, in My Lord and Spymaster, Adrian is Doyle's boss? Anyway . . . that's what the organizational chart would say if they did that kinda thing. Jo Bourne said "Did you notice that in 1811, in My Lord and Spymaster, Adrian is Doyle's boss? Anyway . . . that's what the organizational chart would say if they did that kinda thing." I did notice that! And I meant to ask about it. Is it because Doyle wants to work less or because he is less interested in beaurocracy? Is there a story behind it? The position of Head of Section, especially in England, involves a lot of 'bureaucracy'. A lot of palm pressing and influence peddling and organizing the organization. Doyle wants to be in the field. Wants to 'run and find out'. Wants to play roles. He hates working in an office. Galba keeps offering Doyle Head of Section jobs. Doyle keeps turning that down. He stays an Independent Agent. As he gets older, every Head of Section in Europe listens to him. Even Carruthers in FR, (and she can't give him orders,) is using him for data analysis when the crunch comes. I love when Doyle sniffs at Adrian, "she's not my boss." You see Pax doing his 'stage' (training) in Paris in Forbidden Rose. In case anyone is wondering about all these 'removed by a blog acministrator' posts. These are all some spam bots. I get about 30 a week. Blogger catches most of them, but a few slip through and have to be removed manually.